To start, Tina mounts her drum kit and begins to play. She is wearing overalls, open to the waist, and a latex mask featuring pursed lips on an apelike face. With her blond hair she looks like a cross between a Star Trek inhabitant and Marilyn Monroe. At 11pm the smells of Vegemite toast and tea fill the house. Jo Lloyd, Shian Law and Tina Havelock Stevens have plonked themselves down in my kitchen after a marathon day of organising, stressing, dealing and brainstorming. Earlier, Jo crashed through one of Tina’s drum skins. It had been dealt with; the right rope to wrap around the giant rock-cushions that would drop from the ceiling onto Tina’s drums had been found, the rigging hung and they had a plan. On their second day of working together communication between the three was surprisingly flexible. Shian and Jo had worked together many times but apart from a small promotional video that Tina and Jo had made together, neither of them had worked with Tina. In fact, Shian had only met Tina briefly once a few days earlier to talk about the project. They were exhausted. Vegemite toast and tea, comfort food, would keep the juices flowing for a few hours more. Tomorrow, I’d make more. Tomorrow was the day of the performance. there were a number of moments. When Shian crashed into Tina, when the drum pedal stuck, when the dancers slipped, when I noticed what I thought was confusion in the eyes of the performers, and when their tired bodies became very still before exploding again. I held my breath. Could this performance mis-fire, go awry? Is this the challenge? Jo Lloyd and Shian Law are two dance artists whose work contributes generously to the ecology of contemporary dance in Melbourne. The methodologies they are fostering, individually and in collaboration, are part of a self-styled critical praxis through which they generate conversation on process and practice within artist run initiatives in Melbourne. I have been lucky enough, as a provider of toast and vegemite, conversationalist and sometimes dramaturg, to follow their work along with my own continuing interest in decentered perspectives. They are, I suggest, seeking to activate a ‘politics through action/choreography’. As part of this, their work refuses to participate in cliché or even known discursive practices. While many dance artists are developing methodologies to reconfigure the status quo of practice and production – particularly in the wake of a period in which dance as an independent creative practice has been destabilised – within the context of independent dance in Melbourne, the work of Jo and Shian is considered hard to program, challenging and often confusing. Highlighting their work here provides one perspective of a microcosm of dance culture within a national and international identity that is developing outside of institutions, with meagre funds and good will. Tina Havelock Stevens has various incarnations as an artist. As the White Drummer, she performs in various extreme and mostly durational situations: underwater, in the Mohave desert, in carcases of disused airplanes, in forests, beside large rocks. She says of her responsive presentations, ‘I am always surprised by how where I am informs what I play and how I perform’. Tina’s openness to the experience of letting the situation determine the outcome defines her work and its precariousness, bleeding into her performance art as well as her visual and static installations. Tina plays in her band, the Mumps, as well as with various rock and contemporary musicians. What brings these three together is a recognition of the daring and risk of failure they bring to their respective practices. And desire – desire to subvert anything they might have already known, to subvert anything they might have already seen, and to express that desire in the act of performance. The project that generated this collaboration was FuckDog#Liveworks, a 2-hour in-situ work commissioned for Performance Space, Sydney Gay and Lesbian Mardi Gras and Carriageworks for Day for Night, as part of Liveworks Festival 2017. In Liveworks 2016, Tina presented a largescale video-installation Thunderhead to which she performed a live score. Jo performed with Nicola Gunn in Mermermer (produced by Chunky Move, 2016). FuckDog#Liveworks was a one-off event where the three artists combined their quirkiness in performance to present themes of ‘exposure, intimacy, shame and concealment in relation to the human form’. In this adventure, Jo and Shian continued developing ideas for the free-form FuckDog series, a concept which Shian was expanding. They gave themselves and the project over to the immersive drumming of Tina. Tina threw herself into the deep end with some artists of whom she knew very little, but who she sensed were of like mind and temperament. Jo and Shian often perform for and with one another but they don’t always work together, and their individual work has very different concerns and directions. FuckDog and its various iterations is a work that encompasses some of their shared interests. As an ongoing exploration, FuckDog interrogates the performing body within discourses of gender, power, race and humanity. FuckDog is contingent on its manifestation as a one-time-event and impossible to recreate. Its materiality as a performance has left only a trace – one that I find necessary to try and capture. ‘How does an artist create a performance?’ is the foundational question underlying Shian’s practice. Similar questions have been raised by dance artists in the last decades. Artists such as Jérôme Bel, La Ribot (Europe), Matthew Day, and Martin del Amo (Australia) consistently search for a means to understand the nature of performance and choreography as a contemporary necessity. Rather than minimalising performance to its bare bones, as Day, Bel or La Ribot might do, by ‘doing nothing for a while’ Shian exposes the inside minutiae of his praxis – his thinking and doing process. The outcome is work exposed like a body on an operating table, laid bare for the audience to engage with and experience. In Personal Mythologies (2015), the audience wanders around the space as Shian and a number of visual artist/performers, create and explain their work in-situ, while also responding to instructions. At a point of confusion, Shian asks his dramaturg/choreographer, Jo, to make him some steps, which she does. In Vanishing Point (2017), the historical genealogy of the work is deconstructed in-situ. Archival footage from works in the canon of Melbourne’s independent practice (Phillip Adams, Lucy Guerin) are projected and simulataneously danced by Shian live, exposing his cultural and technical ‘difference’ as a dance artist. The notion of failure enters here as Shian exposes his outsiderness and fragility in relation to the canon he admires. The longer and the shorter explorative works in which he might talk, dance, dress-up, remain for him, ‘non-existent choreographic works.’ The success of a performance depends on its ability to expose and share the impetus and the topography behind its construction. However, ‘…the performance has to be the formulation of questions, [it is] not the answer,’ Shian clarifies. All it can do is present the spectator with information, discourse, and the thinking processes that are immanent to the creative process. The underlying question behind Jo’s practice is, ‘How does the body communicate?’ Jo dances thought that moves as action. In her work, a continuing praxis developed in rehearsal, classes and performance, imaginative visual thinking becomes responsive thinking – gleaned from the conscious as much as from the unconscious – and then translated into active movement. Her extensive body knowledge is committed to finding how to translate sensory thinking into movement. As Helmut Ploebst, points out, ‘dance history has ‘created learned’ technologies that inhabit bodies and in the course of their constant performance, ultimately devour them.’  To uncover a language that might have a deeper learning, Jo defies her culturally, historically and aesthetically inscribed movement memory to generate a body language that explores what she describes as ‘the unknowable’ and the ‘unshowable.’ It is a dangerous form of presentation. As Shian opens his performance theory to scrutiny, Jo opens her body to present an ‘aesthetic unconscious’ that transcends any aesthetic considerations of commercial value. Rather, it finds value in the ‘unshowable’ – the raw and the primal, the uncensored and the unbleached. Her studio practice, finely and consciously disciplined, draws on mathematics, music, geometric patterns and visual associations which, along with her dancers, she develops and crafts into choreographies that are constantly open to change and upheaval. Of her work she says, ‘we work on the body as a tool that knows, but one that also needs to be available to not knowing’, and, ‘body gesture can only give clues as to what the body has to say.’ Her practice as praxis is brought into a constant state of negotiation and renegotiation with itself and her dancers. In Confusion for Three (2015), the dancers learn to interact and to read their colleagues as a kinetic score to which they respond. As they move through not-knowing and confusion the chaoticness of performance comes to rest in a curious form of cohesion. Jo’s work continues to penetrate the unknown. The works that make up the parts of FuckDog are explorations, somewhat like explosions, within the life of their continued longer and larger scaled productions. The first presentation of FuckDog (2016), performed at the artist run space Treloarland Studio in Melbourne, was a 40-minute performance; an accumulation of ideas and action, intention and presentation on Orientalism, colonialisation and sexual politics. The second iteration was integrated into a filmed aspect of Vanishing Point (2017). The third, presented at Meat Market (Melbourne), was an iteration that presented some unexpected concerns. This episode, which included a number of mostly young dancers that Jo and Shian both mentor and teach, demanded an uninhibited physicality, heightened impulsivity and a complex conceptual structure. The choreography comprised a series of mapped out but mostly improvised set of instructions performed at high intensity. The consistent relentless action proved difficult to sustain for some of the dancers, leading to an incident in which one dancer was bitten hard on the leg by an overly enthusiastic colleague. Dramaturgically, this had unintended consequences. Off the podium, it ignited serious questioning around responsibility and ownership in performance. As initiators of the project, Jo and Shian were reproached for not taking enough responsibility for the actions on stage. However, what was exposed was the difficult nature of their work and the fragile nature of the desire to democratise between dancers, choreographers, movement tropes, art practices, spaces, times and people. For the fourth iteration, the one at Liveworks, Shian and Jo collaborated with Tina. FuckDog#Liveworks, was constructed in a cross-fire of ideas over a number of days. It’s score: a set of instructions and a trajectory in space in which actions were planned, objects used and movement ideas worked out. The objects – bits of drum kits, a moveable podium, soft rocks and perhaps other things I’m not aware of – were placed in the space and the responsibilities of each performer clarified. The rules were only partially defined. The two-hour high energy performance took place in a cavernous space at Carriageworks during the afternoon of a continuous 24-hour party. The darkened space had a few lights, one highlighting a drum kit up the back, and various others projected into the space. Other lights were minimally adjusted during the performance. Shian, naked (except for trainers) strides across the space and sets up some loose bass drums and a snare with high-hat. Behind him, a masked Tina at the drums. A large rock-shaped object falls from the ceiling onto Tina’s drums as she plays. The rock looks hard, but it is soft. It’s disruptive. Jo hoists it back up on a pulley. She’s naked and vaguely discernible in the dark. The action is repeated a number of times. Each time, Tina straightens her drums and continues playing. After a while she stops and moves/runs towards the dancers, only to have another large-soft rock thrown at her. She falls, gets up, runs again and the rock is thrown, again and again. This is repeated six or seven times, maybe eight. We laugh; it’s funny, abhorrent and shaming. I laugh at the absolute ridiculousness of this relentless cruelty but in the continued denigration of her futile attempt at integration, I read political connotations. I marvel at how Tina, who has previously done no dance or physical theatre, accepts anything that Jo and Shian throw at her. Her payoff will come, I’m sure. The dancers take possession of the drum kit. Tina climbs on and over their naked bodies in order to keep drumming. She jumps from the back of one to the back of another, not giving up the urge to keep playing. She shouts directions at Jo and Shian into a microphone as to when they should hit the drums and how fast to beat. ‘Now, Now, Now, Harder, Now, Stop, Now, Stop, Now Now!’ It seems as if no-one can function without the consent of the other. There is a power play between body and sound, sight and touch which moves through the interactions with objects animate and inanimate. At times this is subtle, at others, less so. Tina reclaims her drums and keeps playing, knowing, as she has admitted, that ‘drumming is a meditative device but it also whips people into frenzies. It can make people want to fight.’ There is a shamanistic ritualism to the dance that borders on cliché but also works on the primary significant area of our responses. Jo and Shian gyrate, throw themselves at the drums, and use all the parts of the body to manipulate the instruments. They sit naked in front of two bass drums, legs spread as they hit the drum by bouncing with their bottoms up and down on a leaver that moves the stick. The drum is their voice but it also offers a point of safety, security. The choreographic dynamics become reliant on the exchange between dancers and the object; Jo/drum, Shian/drum, Tina/drum. There is a chemistry between the banal/grotesque and the poetic in this theatrical explosion which borders on the dangerous. It’s dangerous because if harmony between ideas and people cannot be found the results are likely to remain trivial. And perhaps, that’s as it should be. Says Shian, ‘There is substance but it is a non-substantial project.’ In walking this fine line, FuckDog complicates the limits of performance and challenges notions of the human form by decentring perception and exposing the exceptionalism of the human as white and gendered. What FuckDog emphasises instead is a joyous and ‘scary’ animalistic scenario in which sanity and lunacy become underlying themes of the experience. and Tina – she banged, screamed, fell, was exposed. She gave herself over to chance and spontaneity. But ultimately, she reclaimed the drum and supplied the beat that drove the performance. By asserting herself and regaining freedom behind the drum she was empowered to open the empathetic space as one that could be responsive. She was unafraid to be out of her depth. Inviting the possibility of failure is a challenge and failure in FuckDog is inescapable and valuable. The performance finishes with Shian and Jo as they pull a cover over Tina and her drums. We are unsure if they will silence her or if she will continue regardless. FuckDog#Liveworks reframes choreography. We learn to reconsider the act of performance as desire, as immediacy, as necessary – this is the political act; the right to ‘be’ bare, different, fail and do. I am referring here to the chaos that was caused by the Minister of the Arts, George Brandis in 2016. The effects of these cuts are still being felt throughout the arts sector. For instance, Dancehouse provides a haven for a number of artists seeking to produce ‘new modes of production’, it also works within the limits of its own particular artistic concerns. Chunky Move’s Next Move also requires artists who fit within the frame of a particular artistic agenda/aesthetic. Neither Jo nor Shian fit well into these concerns, and in fact, there seems to be a question in the community as to where exactly they do fit. While this may not seem important, finding out where you sit in the topography of the dance and performance culture is a question that, at times, requires attention. Fuckdog was originally a project conceived by Jo Lloyd and Francis d’Ath in 2009. Shian’s interest in the piece was also an illustration of his fascination with both of these people, as well as means to understand and honor them. Francis and the origins of the piece do not always come in play but it is important to both of them to ‘keep the elastic to the origin alive.’ (Jo Lloyd). Stephen Farrier, ‘Approaching Performance Through Praxis’, in Studies in Theatre and Performance, Vol. 25, nr.2, pp. 129–143. All comments used here and attributed to Jo and Shian have been given to me during conversations, they are personal communication. Vanishing Point was full length performance made for the Melbourne dance festival, Dance Massive, 2017. 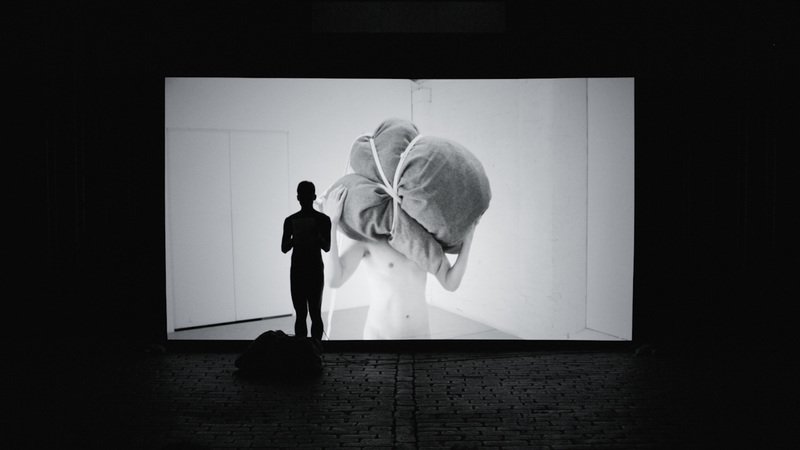 Personal Mythologies was presented at Arts House in 2015. The show was presented twice, a 2-hour marathon during the day and a compressed 15-minute version in the middle of the evenings after-party. In the day, the audience was seated, standing, watching; in the evening Tina (on drums) and the dancers entered into the ‘dance’ space of the partygoers. This intersectionality becomes an important aspect of the gender references likely to arise in any of the FuckDog productions.